That time of the year has come again! The annual event held by the Embassy of Republic of Korea and its subsidiaries with Korean Cultural Center, Korea Festival, is back this year. 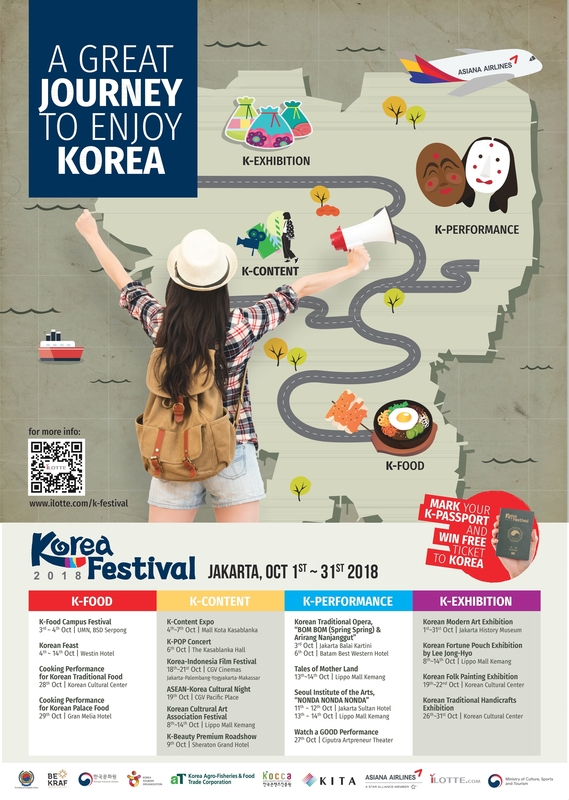 With more events hold and more contents to share, Korea Festival 2018 is guaranteed to make you full with all about Korean culture. Where? CGV Grand Indonesia, Jakarta. CGV Social Market, Palembang. CGV Sahid Jwalk, Jogjakarta. CGV Daya Grand Square, Makassar. In addition, Korea Festival 2018 provides special program “Korea Festival 2018 passport” where attenders can collect stamp and read all information regarding the one-month long event. The “passport” can be attained at KCC desk in every event mentioned above. Collect the stamps after you visit each event and get various gifts, including return tickets from Jakarta to South Korea! For more information regarding this, you can check at KCC official website and social media accounts.